A trio of representatives for a developer explained the definition of a “bedroom” to members of the Peninsula Community Planning Board (PCPB) Oct. 16th at the group’s monthly meeting at the Point Loma-Hervey Library. 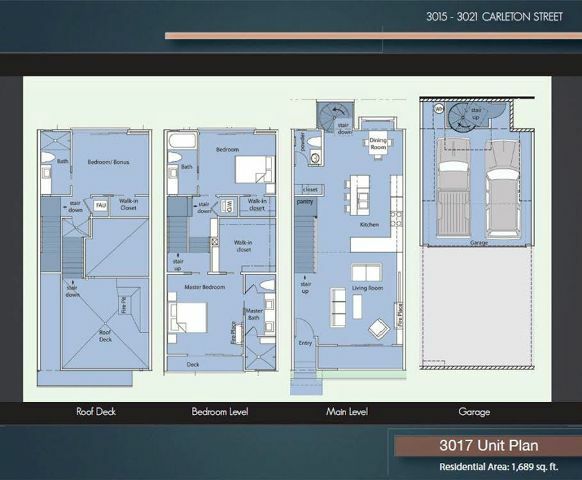 On the website of Acropolis Development, owner of four, three-story units with roof decks and underground parking envisioned as luxury condos now under construction in Roseville, the project is alternately referred to as Carleton 4 Row, Carelton Row Homes, or Carleton 4 Homes. And in response to the question of how many bedrooms each of the four units contain, there also appears to be more than one answer. According to the applicant, each unit contains two bedrooms and a third-floor room that lacks a door or built-in closet. It’s not a bedroom but an “office den,” with an adjacent storage room, which could provide living room space and convenient access to the rooftop deck via a staircase. At least that’s what a trio of representatives for the developer told members of the Planning Board (PCPB). In the kind of action becoming increasingly common at PCPB meetings of late, the board voted unanimously to delay consideration of the project for one month, citing a lack of information and concerns about whether the developer received undue favorable treatment when the city approved construction plans in the first place. Like the other 40-plus community planning boards in the city, the PCPB is a city-recognized body that makes recommendations on land-use and quality-of-life issues. But the board had not reviewed Carelton 4 Row prior to ground-breaking because the application was submitted as apartments which, under normal circumstances, require only nondiscretionary permits and do not trigger review process requirements. The city approved the apartment plans in December of 2013 and construction began earlier this year, said Liz Carmichael of Ecohouse, the architect. On Sept. 19, with the units still under construction, an application for a “map waiver” to legally convert the apartments to condos was submitted, triggering notification and review requirements. The map waiver is a “Process 3” application, which must be approved by the San Diego Hearing Officer and may be appealed to the San Diego Planning Commission. Korla Eaquinta, a Roseville resident, accused the developers of being deceptive for two reasons. One, they submitted the project as an apartment to bypass public review; and two, they submitted the project as two bedrooms per unit instead of three to reduce their obligation to provide parking, she charged. Al Gueddar, a principal for Acropolis Development, denied Eaquinta’s assertions. He said any online references to three-unit condos for sale probably came from a multiple listing service syndicate that made an error. At press time, Gueddar did not respond to emails after the meeting asking why his own company’s website described the units as having three bedrooms. Gueddar also pointed out the PCPB has granted several map waivers for similar proposals in the past. “We’re not coming up with anything outside the box,” he said. The applicant’s representative, David Parot of Ingenuity Engineering Corp., said it’s common to submit a project for approval as an apartment to have options as market conditions change. “It’s all about the timing of the market. As long as you meet the codes, an owner can go either way,” he said. However, there appeared to be at least some support among board members for Eaquinta’s concerns. “I agree with everything (she) said. This has been standard because it’s faster to do it this way,” Board member Jarvis Ross said. “They can convert to condos before any concrete has been poured. But it’s the city’s fault,” he said. Jay Shumaker, who chairs the boards Project Review Committee, also suggested the applicant sought to reduce public review. After the meeting, some board members said they were surprised city staff allowed the third-floor room to be classified as an office den, noting it would be simple to add a door and use the space as a bedroom. Waterpoint condominiums – No promises were made, but a representative of the controversial Waterpoint condominiums at 1310 Scott St. did not rule out a citizen’s request to provide two crosswalks to mitigate for impacts of increased density and traffic. Joe Anfuso, chief financial officer of ColRich, developer of the 1.65-acre property where 40 luxury condos are under construction, told board members a grand opening will likely take place by January of next year. Debbie Pedersen, a critic of the project who calls the project “The Behemoth,” called on the developer to provide the crosswalks on Scott Street at North Harbor Drive and Shelter Island Drive. “I want ColRich, who’s profiting so greatly, to step up,” Pedersen said. Replied Anfuso, “I’m happy to bring that up and happy to suggest that.” Board Vice Chair Mike Ryan invited Anfuso to provide another update of the project at the next scheduled meeting Nov. 20 at 6:30 p.m. at the Point Loma/Hervey library, 3701 Voltaire St.
Kellogg Beach parking restrictions – By a vote of 6-2-1, the board approved doing away with parking restrictions around Kellogg Beach. Two-hour parking has applied between 8 a.m. and 2 p.m. from Monday through Friday for roughly a decade, said Charles Hope of San Antonio Avenue. The city posted the signs to prevent long-term parking from staff at the nearby submarine base. With the construction of two parking structures, military personnel no longer need to spill over into adjacent neighborhoods, and the signs have become a nuisance, Hope said. But board member Don Sevrens warned a backlash could result if the signs are removed and citizens who like the signs don’t know about it. Hope said removing the signs would require a vote of the San Diego City Council but doubt was expressed by some, including Rollin Bush, aide to District 2 City Councilman Ed Harris. Cañon Street Pocket Park – Supporters of a pocket park at a quarter-acre vacant lot along Cañon Street are looking for ways to get a professional design on a shoestring budget. Board members Severns and Jon Linney, who are spearheading the effort, said they will reach out to local colleges and professional associations to see if anyone will design the park for free. The lot, which sits just west of where Avenida de Portugal dead-ends, used to be a road right-of-way but is now controlled by the city’s Parks and Recreation Department. Supporters envision a passive park with benches, landscaping and trails. Former Board Chair Cynthia Conger suggested a community garden to increase usage and discourage homeless activity. It’s not always clear what constitutes a bedroom in San Diego, but that looks pretty clear. Especially when they advertise it as such on their own website. Come on, man! I still haven’t heard back from Acropolis to explain the contradiction, but I will post an update when I do. The project manager on Carleton St (who also managed Ave. de Portugal) suggested I send a letter to the Building Official about the Carleton St Condo issue. Following is the letter I sent to him back in August-BEFORE they even applied for map waiver. It seems the web site is no longer advertising these units and the 3 bedroom sign visible from Rosecrans is down. However, they are still for sale. North Park planning board is having this same issue with building apartments, map waiver, and then converting to condos. Please review and place this letter in the official record for this project. This is another structure approved magisterially (ministerially) as an apartment, which was always going to be condos. PLEASE deny request for tentative map approval due to negative impact on community and lack of community input in the process. PLEASE deny any future permits for apartments by magisterial approval knowing full well that they really want to build condos. The following link shows that these units are already advertised for sale BEFORE they received approval for conversion. This link also advertises these units as 3 bedroom. IF they are actually 2 bedroom, then they should advertise as such and not use this builders “trick” to reduce required parking and make their units more sellable. The community has lost confidence in the city and the review process because of numerous other projects including Avenida de Portugal and Water Point. Community input and transparency are crucial in the development that we all fear is coming to Roseville. The conversion from apartments to condos only requires the “map waiver” and application for the map waiver doesn’t trigger a review of the design. By the time of the map waiver application, the design is set and approved and construction is underway. The only thing the planning boards can consider is whether or not to approve the map waiver itself, there is no discussion of the project itself. This is the whole purpose of this mechanism, it allows developments to skip public review. When I was on the PCPB, I decided to vote against all of these as a matter of principle but it did not affect the projects. The applicants usually sent someone to the planning board who was only shepherding the map waiver and usually knew nothing about the project and would not address project comments. Very frustrating. This procedure, the 50% rule, and new rules on guest quarters, companion units, and accessory structures are designed to eliminate public review and they are transforming the Peninsula and not for the better. Geoff, I agree. Don’t know who gave the presentation at the last board meeting but it was as you described above-he didn’t seem to know much. I don’t know how to change this procedure but I say again, community input and transparency are crucial.